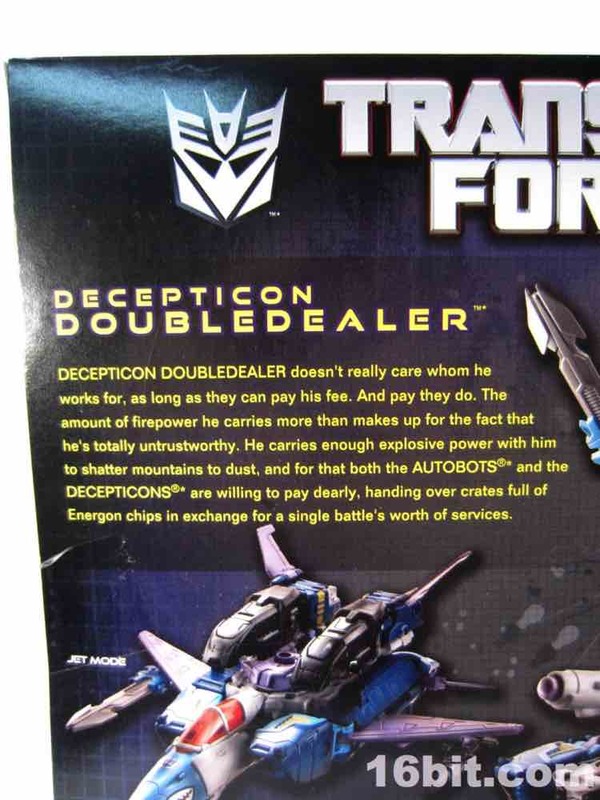 The Transformers franchise seems to require the reuse of designs to make ends meet, so Decepticon Doubledealer is a rather clever reuse of Blitzwing. 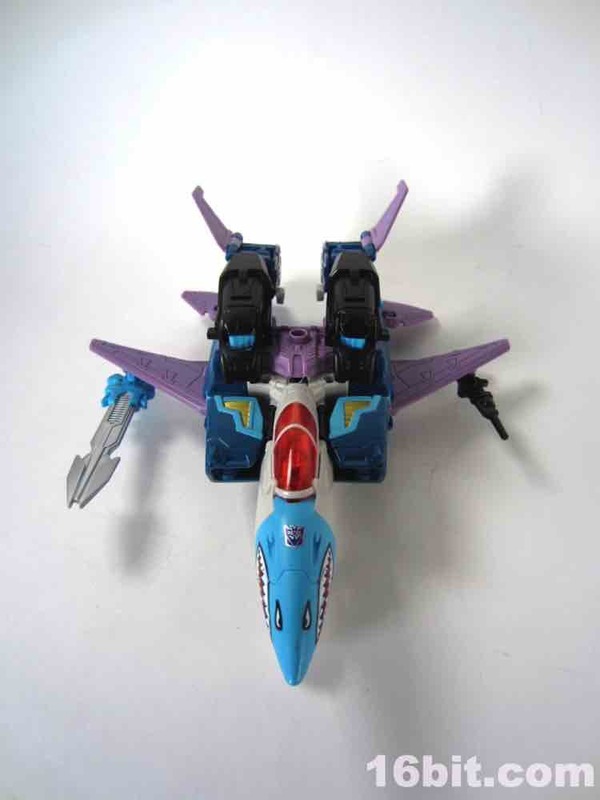 In Japan, the Doubledealer mold is getting a new lease on life as a triple-changing Starscream, but Americans get to enjoy a value-priced update of a G1 character that turned into a tank or a bird. I'm also not ashamed to say that when I first saw this toy before the public announcement, I had no idea who the Hell he was. 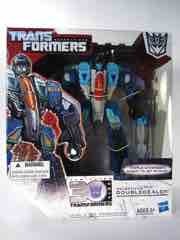 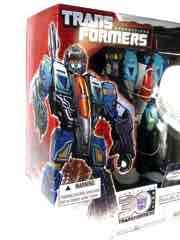 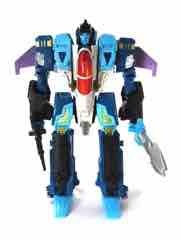 This toy started showing up at big box stores in spring, but it showed up online in December of last year - that's an eternity in this day and age, where an item not showing up in a timely fashion may mean a short run or a de facto foreign exclusive like some recent Beast Hunters deluxe and Cyberverse toys. 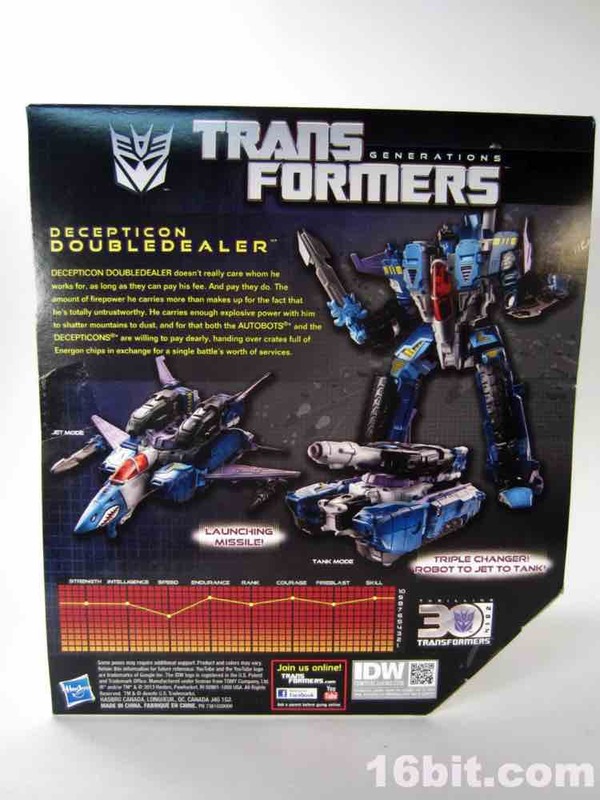 This toy did make a heavy appearance at many stores lately, so you could probably get as many as you would want - around the same time Blitzwing dried up a bit, and I'd say Doubledealer is the better executed on my samples. 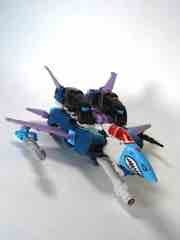 Blitzwing may have the G1 love, but Doubledealer has more creative paint applications and tighter joints. 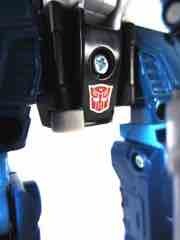 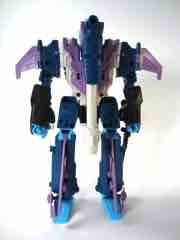 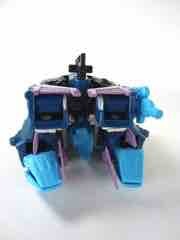 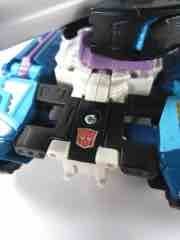 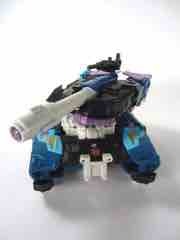 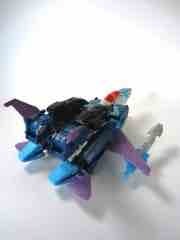 The jet mode is a tribute to the original double-agent's bird mode. 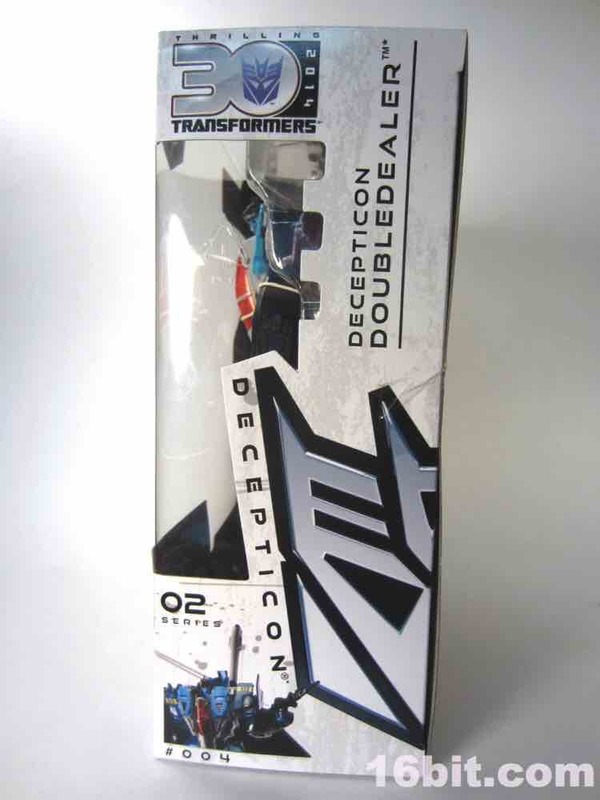 This toy has Decepticon logos on the bird, and Autobot on the tank - this plays up his double-agent nature in the original toy line, so this figure could fill whatever shelf you wanted while helping Hasbro to get a toy out that can be good or evil. 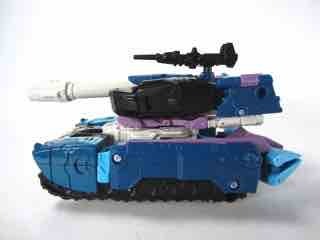 This is pretty important in that most toy lines, the heroes sell best and the bad guys can be a bit of a challenge. 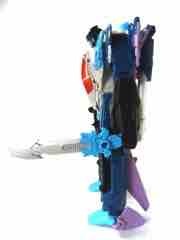 (Notable exception: Star Wars.) Decepticons aren't a deep pool of characters with massive recognition, so seeing this deep cut is something of a delight. 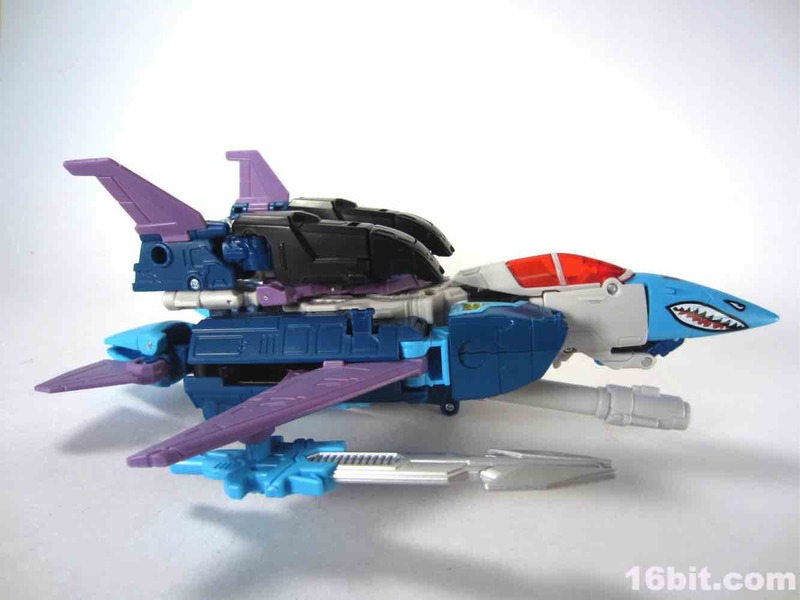 The jet is pretty sturdy, with a few gaps and I had some difficulty finessing it together due to soft elements and hard elements not quite meshing. 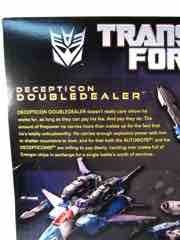 (That's what she said?) 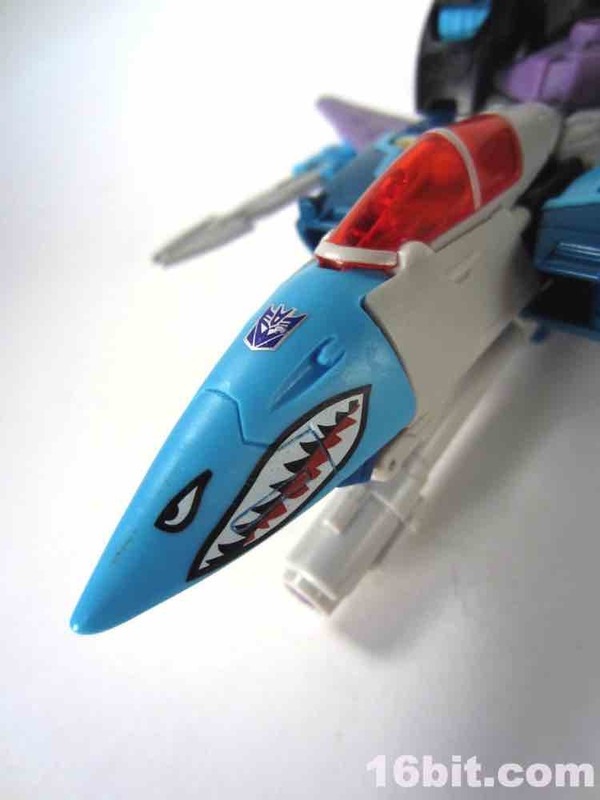 I love nose art on toy aircraft, and the eye/mouth combo platter gives the vehicle more personality than most non-Beast Machines jets. 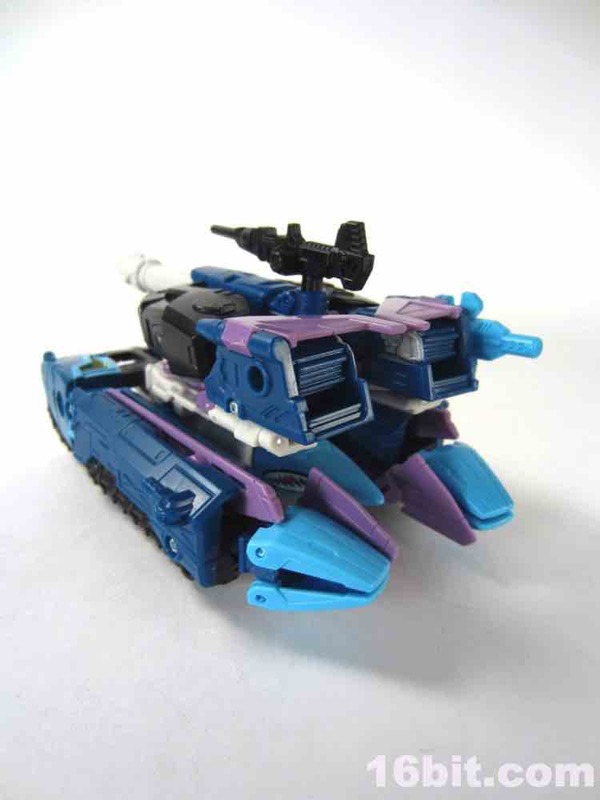 As a tank, it's basically the same as Blitzwing with dubiously rolling wheels and a rotating turret. 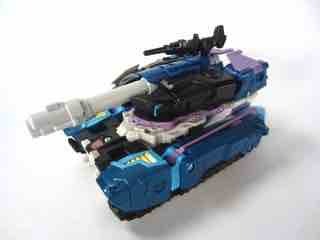 I like how it pieces together and it's appropriately bulky and tankey. You can see the Autobot symbol near the front of the turret, and the blue/grey/purple/black deco carries through nicely giving him the flavor of a late-1980s Decepticon. 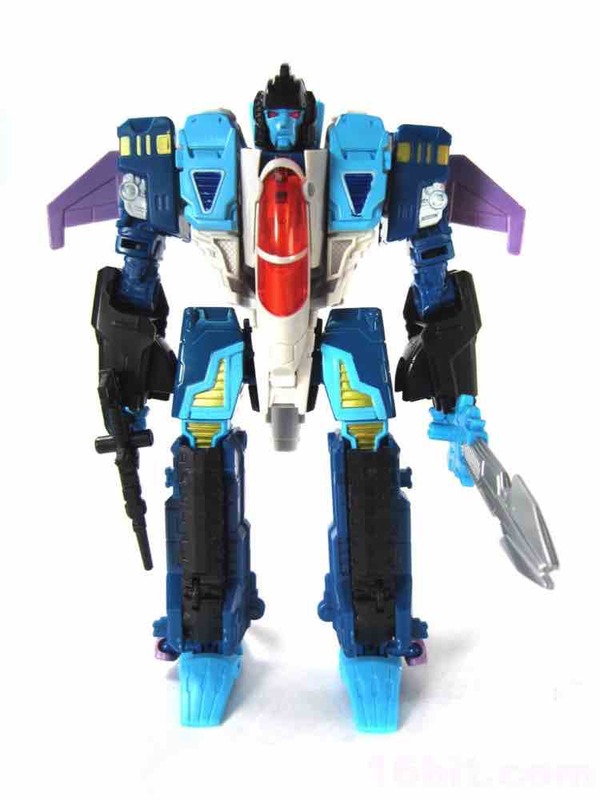 Due to his stiffer joints, I like this toy much more than the somewhat floppy Blitzwing. The legs don't fall according to gravity, rather they seem to stay put when you move him around. He's tall, has a rocket backpack, and the head has a design similar to the orignal packaging art. I can't unsee the face as a sort of mustache, so I quite enjoy it for its swollen cybernetic weirdness. Articulation is great - thighs, hips, wrists, shoulders, biceps, the works - but like with Blitzwing the shoulders don't quite pin in place. Some pieces are going to move around a bit for this reason, which I'm guessing is going to be more or less "normal" for any collector-level toy these days. 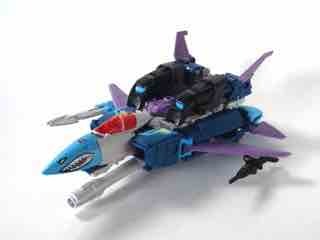 Rarely are the Voyagers perfect, but they're still pretty great. 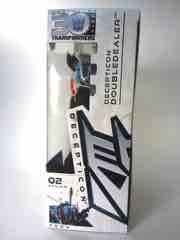 The deluxe toys seem to offer the most sturdiness for the price, with notable exceptions. 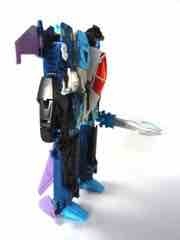 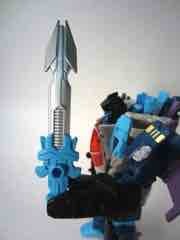 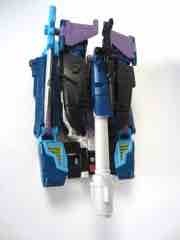 The painted blue and silver sword is joined by a swell black gun, neither of which give him any problems. 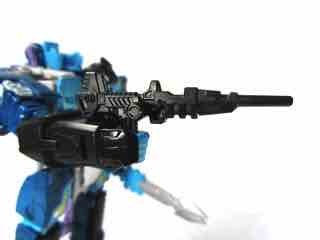 He can carry them without a hitch, and they're a perfect 5mm fit unless you'd prefer to swap them out with old RoboLinks or new BMOG weaponry. I found this toy significantly less frustrating than Blitzwing, mostly thanks to improved joints and a paint job that didn't feel like something I've seen one too many times. I'm hardly sick of Blitzwing, but his floppiness and - in places - sloppy paint left me hungry for a new, better, and possibly smaller toy. 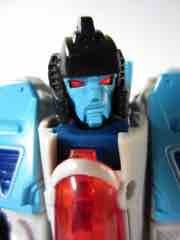 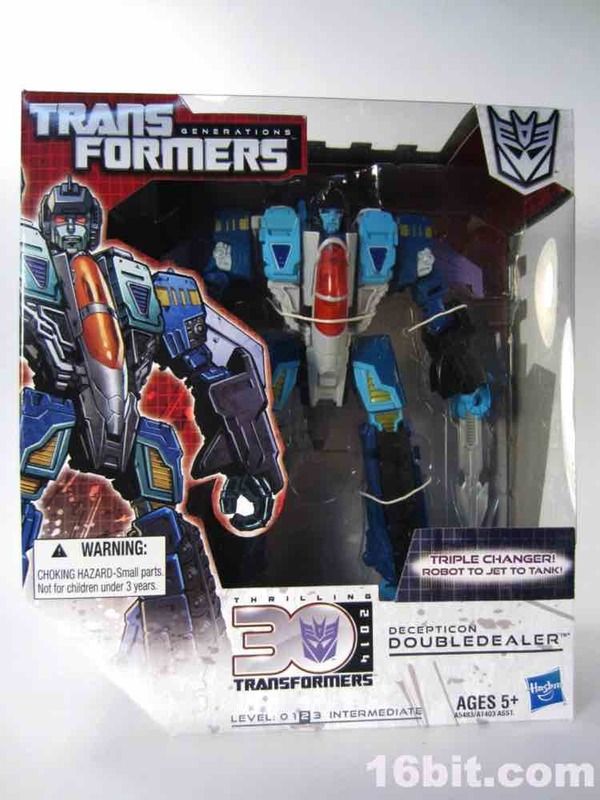 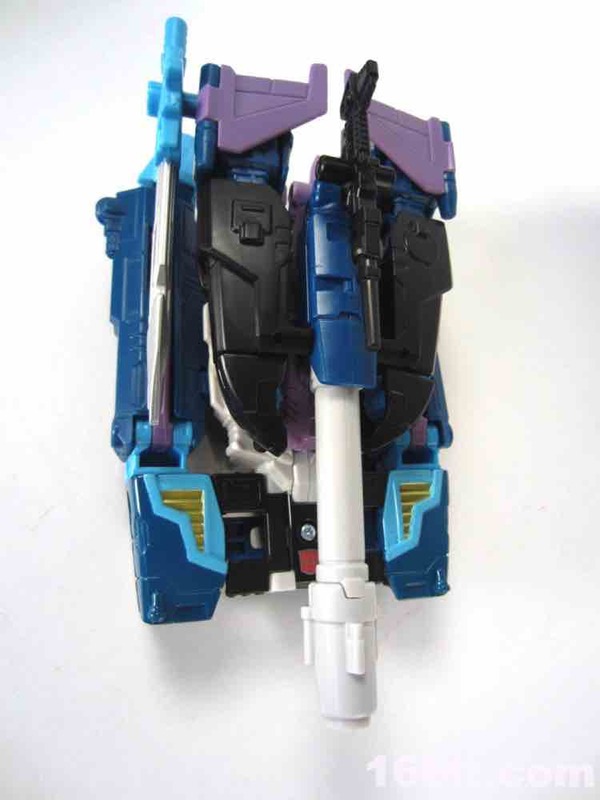 As Doubledealer goes, I assume we'll never get a bird/tank/robot triple changer. 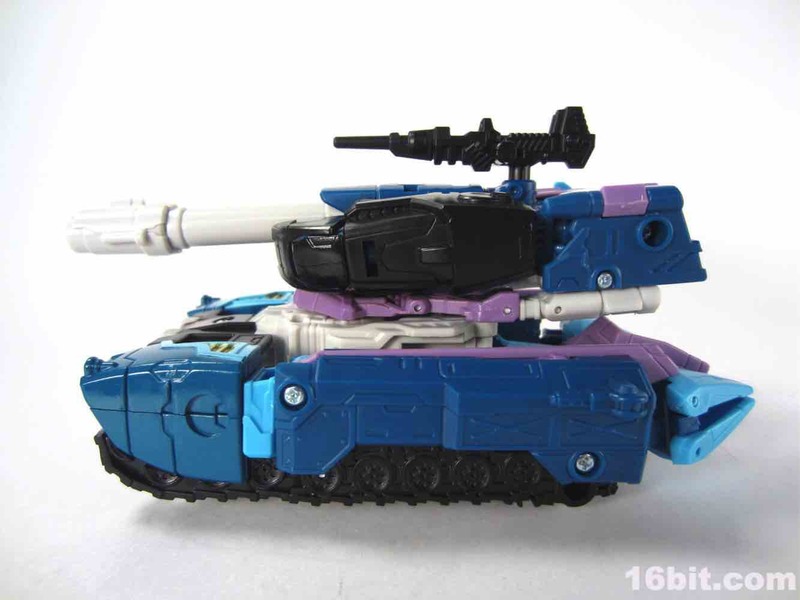 For that reason, I feel this is a solid update for a cross-faction character and if we never get another one, it'll do. 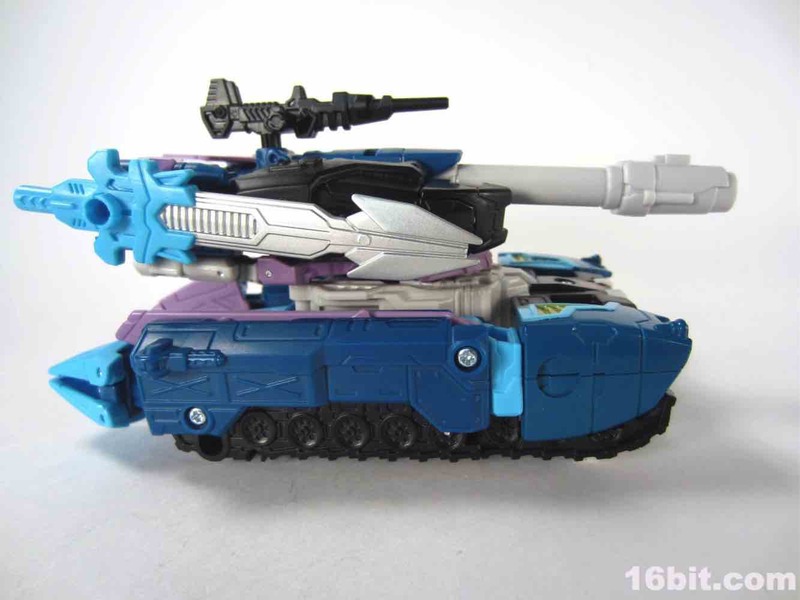 I'd say get it on sale for maximum enjoyment, but anything surrounding $20 is still a worthwhile purchase if your toy shelves allow for one more sizable toy.